Providing a purpose-built shelter for cats means they will not have to go looking in neighbors’ crawl spaces or porches for a warm, dry place to rest. It can keep them safe from the elements, and it will help you control their location and deter them from seeking shelter where they are not wanted. 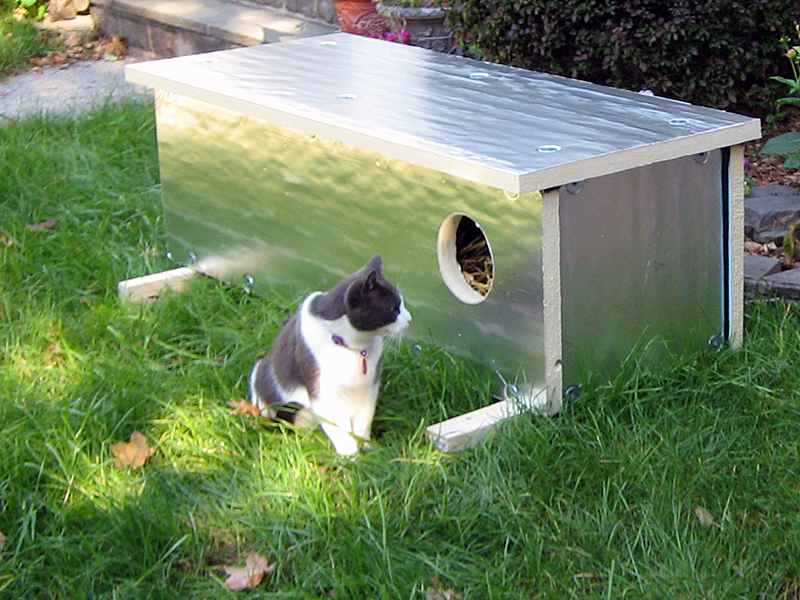 An insulated winter cat shelter may save your cats’ lives in the cold weather. Cats generally use shelters during winter months more than others, but they also provide shelter from rain and sun in warmer weather. The minimum size for a shelter is about 12″ x 18″ x 12″ and will fit a single cat. A 24″ x 24″ x 18″ shelter will fit three or four cats and is preferable because cats will benefit from each other’s body heat. Larger shelters are not necessarily better, because if they are not filled with cats then the heat disperses quickly, leaving the inside as cold as the outside. A space lined with straw and just big enough for three to five cats to huddle is best. 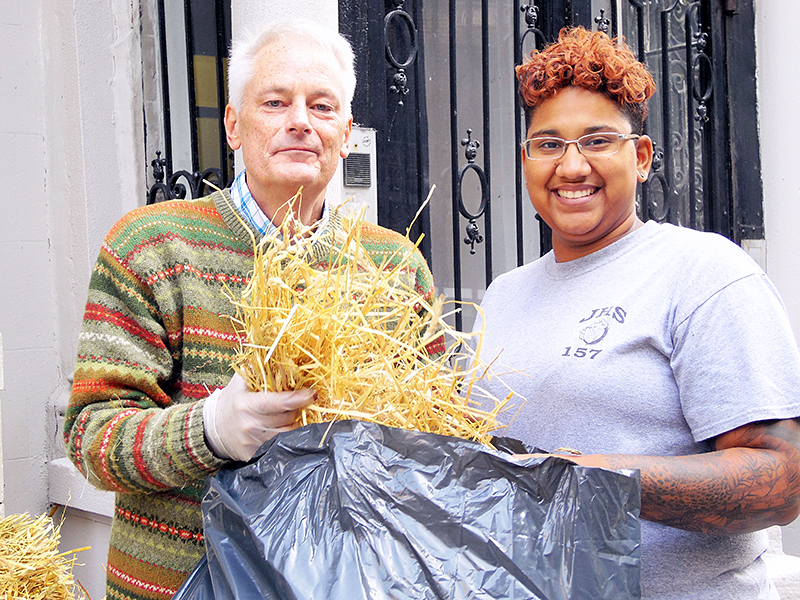 Consider size for transport in a vehicle to and from the colony site as well, and note that the Mayor’s Alliance for NYC’s Animals Wheels of Hope is available to provide free transportation of winter cat shelters. The shelter entrance should be as small as possible, about 5″ to 6″ in diameter (shape doesn’t matter). The size of the hole will minimize heat loss and prevent larger animals, such as raccoons or predators, from getting into the shelter. The smaller the hole, the better. Cats can get into surprisingly small openings; if they can get their head through a hole, they can get their whole body through. Cut the hole about midway between the floor and ceiling and off to one side of the longer side of the shelter. This placement will keep the straw from falling out, retain heat near the ceiling, and minimize drafts. An added awning or curtain over the entrance will help keep the elements out of the shelter. If adding a curtain, be sure to do this gradually so the cats will get used to it. Some caretakers like to provide two entrances/exits for safety from predators, but we recommend one entrance for its superior heat conservation. If it is small enough it will deter predators, and strategic placement of the shelter will protect cats from predators. Shelters should be raised off the ground to keep snow from blocking the entrance and to prevent rain from splashing up into the entrance from the ground. Lightweight shelters should be weighed down. Place rocks, bricks, or wood on top, or place a piece of plywood on top of two shelters facing each other to create a “breezeway” entrance between them. Weight can also be added to the bottom of the shelter by attaching a wooden mini-pallet or pieces of 2×4 lumber. This also raises the shelter off the ground. It is important that the walls of the shelter are insulated to retain the cats’ body heat. One-to-two-inch-thick foam insulation is an effective material that is easy to find. Foam boards can line a plastic or wooden shelter, or a very simple shelter can be made by cutting a hole in a large, sturdy foam shipping container. For added insulation in extreme cold, line the shelter with shiny heat-reflecting material. For example, use foam construction insulation coated with foil, heat-reflective Mylar blankets, or Mylar bubblepack (used for shipping tropical fish — pet stores may give this to you for free). It is important that you put proper bedding inside. Straw is the best bedding; it repels moisture and provides insulation, making it ideal for keeping cats warm and comfortable all winter long. Be sure that you buy straw, which is bedding, and not hay, which is feed. Blankets and towels should never be used as bedding; they do not insulate and can actually steal heat from the cats’ bodies. Blankets also retain moisture and can become moldy. Many different designs for effective winter cat shelters are available online. Some can be made with very little skill and free or cheap materials, and others require basic carpentry skills, tools, and more elaborate materials. Ready-made shelters are also available for purchase. No matter which shelter design you use, it is important that you put proper bedding inside. Straw repels moisture and provides insulation, making it ideal for keeping cats warm and comfortable all winter long. 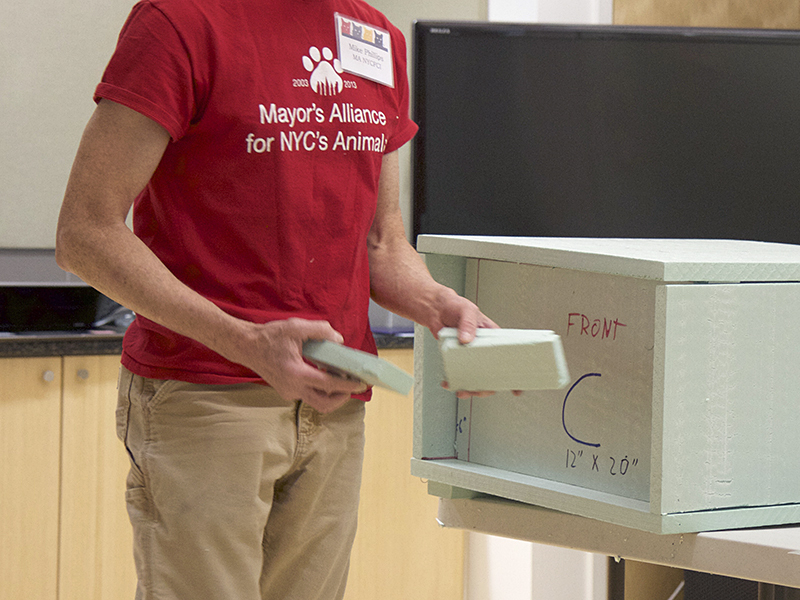 Learn the materials, tools, and skills needed to build warm, waterproof shelters to protect feral and stray community cats from cold winter temperatures and precipitation. We will demonstrate how to build two styles of outdoor winter shelters. You will also learn about cat shelters that are available for purchase.